While you can always provide the fully qualified URL to a phar for installation, having a memorable alias is of course more convenient. To make your phar based project available to PHIVE users, you can either use your Github project identifier (username/projectname) or need to register an alias for it with phar.io. Downloads can be made available using Github releases or you can choose to provide your own download repository. 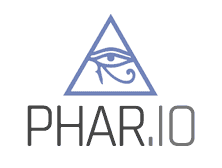 To register your alias please provide a PULL Request against the phar.io database file. To distribute phars via Github in a PHIVE compliant way, it needs to be made available as an attachment to a release - alongside with a valid gpg signature. For PHIVE to pick it up, the filenames need to end on ".phar" and ".phar.asc" respectively. PHIVE supports Github's releases feature for repositories as of version 0.3.0. See the HowTo for Github releases. If you do not want to rely on Github releases for distribution, you can also run your own repository server. For this to work, merely a TLS enabled webserver and an xml file providing the necessary meta data is required. You can find an example for such a file here (XSD). It is recommended to have this file auto-generated, for instance by using the Phar-site-generator by Sebastian Bergmann. Please be aware that only secure downloads via HTTPS are supported by PHIVE.